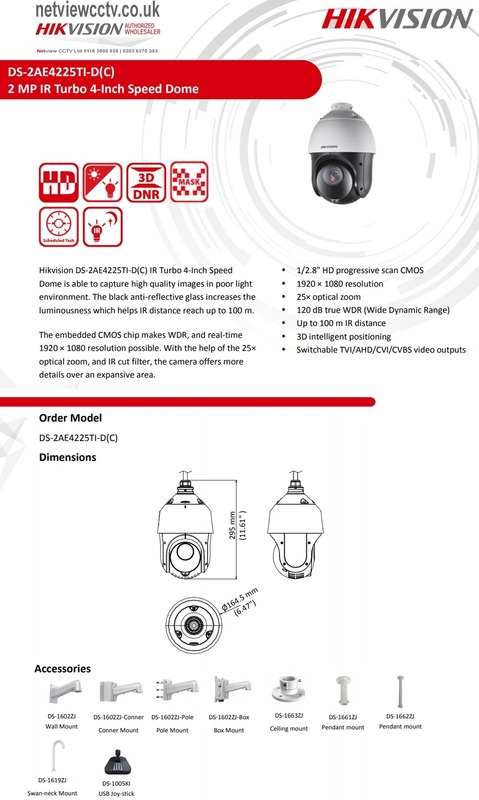 Hikvision DS-2AE4225TI-D PTZ Dome Camera is able to capture high quality images in low light environment with its black anti-reflective glass and 100m IR night vision. The black anti-reflective glass increase the luminousness which can reach up to 100m. Embedded with HD progressive scan CMOS chip makes DWDR and 2MP real-time resolution possible. With the 25X optical zoom Day/Night lens, the camera offers more details over expansive areas. Glare is a very common problem for security cameras. Regardless of the surface or source that’s causing the glare, the fix to the problem lies in a particular feature that not all security cameras have This “anti-glare” feature is known as Wide Dynamic Range. WDR combines the images it gets from two different exposure types. It then takes those images and combines them into one. The end result is an image virtually free from any lighting issues. Connection to the internet is a breeze with the Hik-Connect Setup without any technical or port forwarding knowledge or expertise required. FREE iPhone, iPad, Android, PC & MAC remote viewing software (iVMS 4200 & Hik-Connect). Pan Tilt & Zoom the camera remotely using the Hik-Connect App.